Edgemont will be sending a wrestler to the New York State Championships for the 12th year in a row! What’s most incredible about this accomplishment is the sheer number of people involved in making this happen over the years: the dozens and dozens of wrestlers, coaches, parents and alumni (certainly including you, if you’re reading this!) who all had a hand in this over the years. 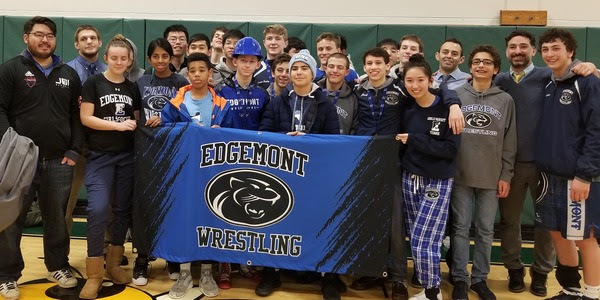 More than anything, it speaks to the incredible culture of the Edgemont Wrestling family that we’re all a part of – so many people focused on helping to build our kids into Champions on the mat and in life. It’s pretty humbling. When you dig into the details of it and you start to look at our Sectionals tournament, it’s even more meaningful. I have to tell you, one thing I’m not very good at as a coach is appreciating that in the moment. The Section 1 Championships is such a whirlwind weekend for our coaching staff that my attention is entirely focused on the tasks at hand. Making sure our guys are properly warmed up and prepared for their matches, getting their heads in the right place, scouting and creating individual game plans for each opponent and coaching the actual matches! That’s not even mentioning the roller coaster ride of joy, agony, pride and frustration that comes with being so invested in our athletes. I’ve found this leaves me about zero time to stop and appreciate the amazing effort and accomplishments of our kids during the weekend. Thankfully for me, I have my amazing wife (and psychologist at times) Katie, to point these things out to me at breaks in the action! When the tournament ends, it really starts to sink in. This year was no different. This past weekend was such an amazing display of heart, tenacity and resilience on the part of our kids! As a coach, I couldn’t have asked for more! Every wrestler who took the mat for us fought start-to-finish. Every member of our roster worked so hard to support one another throughout the weekend. We didn’t win every match, but we certainly battled every single time we stepped on the mat. As a team we finished 6th in the Section – a pretty incredible feat considering that 18 of the 22 student-athletes on our roster are freshmen and sophomores! We were the youngest, least experienced team in the entire tournament! We had Edgemont’s 23rd all-time Section Champion – Nick Meglino – who will proudly represent Edgemont and Section 1 at the NY State Championships at the Times Union Arena in Albany on Februrary 23rd and 24th! 99 – Sophomore Jack Novarro really hit his stride after being sidelined the earlier half of the season with an elbow injury. Jacky made it to the semi’s before taking a loss to a tough competitor from Putnam Valley. From there, Jacky couldn’t be stopped, securing a 2nd period pin over Croton in the consi-semi’s and a 15-3 major decision over Pearl River in the 3rd place bout. I have no doubt we’ll see Jacky back in training in a week or two working hard to improve his finish even further next year! 106 – Sophomore Kion Yaghoobzadeh also wrestled a great tournament and netted himself a 5th place finish – his first time on the podium at Sectionals! Kion has made such huge improvements over the course of the season it was great to see him reap the rewards of his hard work! Kion lost to a tough opponent in the quarters (there’s no way he’ll ever lose to that kid again if we see him next year! ), and from there went to work in the wrestle backs. He rattled off two pins in a row and found himself in the 5th place match where he won a hard-fought 3-0 decision! Kion is another sophomore who will no doubt be stepping up his game over the next few months. We’re excited to see where it takes him! 113 – Freshmen Mitch Kronk and Fernando Lens competed for us here. While neither placed, both showed great effort and fight. Mitch got off to a great start in his first bout, putting a lot of points on the board before getting caught in a bad position. Fernando wrestled better than we’d ever seen him, including a thrilling come-from-behind last second takedown and back points to get a win in wrestle backs over Woodlands! If we can get these guys on the mat in the next few months, they have a ton of upside! 120 – Sophomore Miles Teperman wrestled the best tournament of his life. After pinning his way through to the semi’s, he met up with an opponent from Pleasantville who pinned him a few weeks earlier. Miles wrestled a great match, but came up just a bit short dropping a 10-8 decision. In the consi-semi’s Miles wrestled probably the most complete match of his career, leading to a 13-0 major decision over a very tough opponent from Putnam Valley. Miles finished 4th in the Section – his first time placing! He’s another one of our super-sophomores who we’re very excited about. Also at 120 was freshman Chris Ahn making his Sectionals debut. What Chris lacked in experience he made up for in effort with two hard fought bouts. Looking forward to seeing his progress next season! 126 – Sophomore Kenny Zhong and freshman Nico Wisnivesky wrestled at 126 for us. Neither placed – but just wait till next year. Kenny is a first-year wrestler who’s battled hard all year. Kenny is pretty strong, with a ton of heart and he never gives up. When we get him some more mat time, he’ll be dangerous. Nico is also a rookie on the varsity team and has gotten better by leaps and bounds this year. He’s really getting close to turning the corner and being a very successful part of our lineup. If he progresses as much this coming year as he had the last 12 months, look out! He will definitely be on the podium as a sophomore! 132 – Senior captain Georgie Guarnieri showed the world why he’s such a great leader in our program and a fierce competitor on the mats. Throughout his senior year, Georgie has stated his biggest goal was to finish his senior campaign with no regrets and I think it’s safe to say he did just that. Georgie worked so incredibly hard this year honing his skills and becoming really strong in all positions. He always had a great attitude and set an great example for his teammates with his dedication and care. Wrestling a really tough schedule at a really tough weight class, didn’t make his journey the easiest, but he always persevered. He took a 6th seed into Sectionals and again wrestled the best tournament of his life. Georgie pinned his way into the quarters where he faced a familiar foe in Pleasantville’s Chris May. May pinned Georgie a couple of week prior and again managed to get the best of Georgie with a 6-5 decision. That dropped Georgie into wrestlebacks, but he would not stop there. Georgie rattled off three straight wins to work his way into the third place match, again facing Chris May, who’d lost in the semi’s. This time the result was different. Despite having never taken May down in any of their prior meetings, Georgie had 3 this match to win an 11-4 decision and take home All-Section Honorable Mention honors and a 3rd place finish! Also here was freshman Dan Hahn. Dan is another first-year wrestler – he had never stepped on a wrestling mat prior to this season. The progress and improvement he’s made since the beginning of the season has been awesome! Dan didn’t win at Sectionals this year, but I think he’s really found his sport. He has a ton of potential, learns quickly and will definitely be a vital part of our team in coming years. 138 – Freshman Sumeddha Biswal took the mats for us at 138. She is as tough as they come. It is not easy for a freshman at 138. Even harder when you’re a girl wrestling almost all boys. From the very beginning of the season to the very end, Sumeddha has been a consistent role model for grit, resilience and mental toughness. She is an awesome teammate who works hard everyday to get better and embraces the challenges she faces in wrestling head on, with courage, hard work and a great attitude. Can’t wait to watch her start beating a lot of those boys next year! 145 – Junior Phil Ahn and freshman Matty McCormack wrestled at 145. Phil has had a tough season wrestling one of the most challenging slates of competitors on our team. While he didn’t accomplish his goal of placing this year, Phil has continually demonstrated himself to be an awesome teammate. Not only that but he absolutely has the ability to place very highly next year in his final run. Phil is committed to getting better this off-season and the results should be there once he gets that done. Matty had an awesome freshman campaign. He’s another example of a kid who got better and better and tougher and tougher with each passing week. His natural scrappiness makes him a tough competitor to face. As soon as we get him some more mat time to shore up his positioning, I see a lot of success in his near future! 152 – Freshman Zach Frain wrestled here. Zach wrestles a pretty unorthodox style. His biggest challenge is that he has not yet mastered the areas and positions where he’s strongest. It also sometimes leaves him in vulnerable positions that his opponents have been able to take advantage of. The great news about Zach is that as he develops his style and gets some more experience and familiarity with the common situations he gets in, he’s going to VERY difficult for his competition to wrestle. It’s fun to coach guys who wrestle a little differently and they’re pretty fun to watch too. Stay tuned to see some great things from Zach next year. 170 – Junior Nick Meglino and freshman Dexter Seeley shared duties at 170 for us. As you read above Nicky was dominant. He was never in trouble and controlled every opponent and every match! Now we’re in the thick of things preparing him for Albany and he’s been looking great. Can’t wait to unleash him on the rest of NY State in 9 days. More info on States coming soon to your inbox! Dexter Seeley was our only freshman to make the podium, finishing 5th in the Section at 170 – truly an awesome accomplishment for a 9th grader! Often times as a freshman at an upper weight class you’re a boy competing amongst men. Dex lived up the challenge. I know I sound like a broken record, but he’s another great example of our freshmen. He’s a kid who comes in everyday, isn’t afraid to work hard, isn’t afraid to take his lumps and keeps getting back up and facing the next challenge head on. Well, you do that enough, and inevitably it will start to pay off. That’s what happened this past weekend. After losing a tough one in the Round of 16, Dex wrestled himself all the way back onto the podium. We have a lot to be proud of with him and his upside is tremendous. Watch out Section 1. 195 – Last, but certainly not least, is senior Maunil Kothari. Maunil ended his career with his first Sectional placement, taking 6th this past weekend. Maunil has been an important part of our team this year and will surely be missed! Overall, the Section 1 Championships this past weekend was an amazing way to celebrate the hard work, effort and sacrifice that our kids have made over the past several months and several years! We have a very special team this year and an amazing group of kids. They’re only beginning to scratch the surface of their potential and I can’t wait to see how much better they get next year! Now… on to the State Championships! Stay tuned for updates!